Image caption Could harvesting horns from rhinos like these be a way of saving the species? A group of environmental researchers says that legalising the trade in rhinoceros horn is necessary to save the animals. Writing in Science journal, they argue that a global ban has failed to stem an "insatiable international demand". The authors say the market could be met by humanely shaving the horns of live rhinos. At present in South Africa, poachers are on average killing around two rhinos every day. According to the lead author of the research Dr Duan Biggs from the University of Queensland, poaching is now out of control. "The current situation is failing, the longer we wait to put in place a legal trade the more rhinos we lose," he told BBC News. "It is an urgent issue, we must start the process of getting a legal trade evaluated and put in place soon." At present it is estimated that there are around 20,000 white rhinos left with the majority in South Africa and Namibia. There are also an estimated 5,000 black rhinos still alive, but the western black rhino was declared extinct in 2011. Any trade in rhino horn is prohibited under the Convention on the international trade in endangered species (Cites). Delegates from 178 countries will meet in Bangkok next week to update the 40 year old treaty. But according to the Science paper, the ban is actually boosting illegal poaching by constricting the supply of rhino horn and driving up the price. In 1993 a kilogramme sold for around $4,700 - In 2012 it was selling for $65,000 for the equivalent weight. Attempts to restrict the trade by persuading consumers of Chinese medicine that rhino horn has no therapeutic effect have also failed. Image caption Conservation workers remove the horn from a rhino to make them less attractive to poachers. In their report, the researchers argue that by humanely shaving the horns of live rhinos, enough material could be generated to meet global demand. Rhinos grow about 0.9kg of horn each year and the scientists say that the risks to the animals from horn "harvesting" are minimal. The researchers advocate the setting up of a central selling organisation that could DNA fingerprint the shavings and control the market. Rhino horn would be legal, cheaper and easier to obtain they say. But many wildlife campaigners fundamentally disagree. "We don't support the idea of legalised trade at this time because we just don't think it is enforceable," says Dr Colman O'Criodain, a wildlife trade policy analyst with WWF. "The markets where the trade would be directed, particularly Vietnam, we aren't satisfied that they have the enforcement regime in place that would prevent the laundering of wild rhino through this route." "We don't think it would stop the poaching crisis, we think the legal trade could make it worse," he added. But Dr Biggs and colleagues point to the experience with crocodiles as an example of how a legalised trading regime can work for the benefit of a threatened species. "There has been a very successful legal trade for some time now which has more or less eradicated pressures on wild crocodile populations," he said. "We have strong evidence that it works and the crocodile example shows it can work in low income countries and those without a strong governance structure." The scientists say they don't like the idea of a legalised trade but believe it is the lesser of two evils. They also argue that because of the trade ban, conservation resources are being taken away from other actions and are being redirected to anti poaching. "Essentially what is being created is a pseudo war with people some from the local communities who are involved in poaching," says Dr Biggs. While no proposal to lift the ban is on the table at next week's Cites meeting in Bangkok, the South African government is said to be investigating the issue and says that discussions in the Thai capital will guide their position. 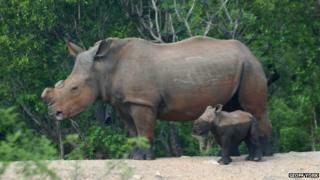 Could legalising horn trade save rhinos?